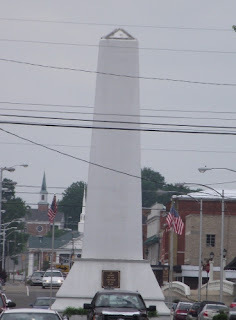 We took this photo of the monument in Elizabethton, TN while we were on vacation. It's in the center of the traffic square in the heart of town. Photographs are best when taken from the nearby park where the Doe River Bridge is located. The problem is that I discovered this after my camera batteries failed. It's a good thing too. I now have a good reason to go back to Elizabethton, TN. It's an easy town to enjoy. The historic district has quaint shops and some very pretty houses. A brochure of the walking tour can be picked up at the Tourism Welcome Center by the Chamber of Commerce. Plenty of street parking is available in Elizabethton. You can actually park your car and walk up to the monument. Just step carefully since you do have to cross the traffic circle. The towering monument was dedicated in 1904. It is called the Veterans' Monument Obelisk and was dedicated to Confederate and Union soldiers. The photo gives a general idea of the size of the monument. Nothing is like seeing up close. To me, it's pretty impressive that something like this could be built over 100 years ago.